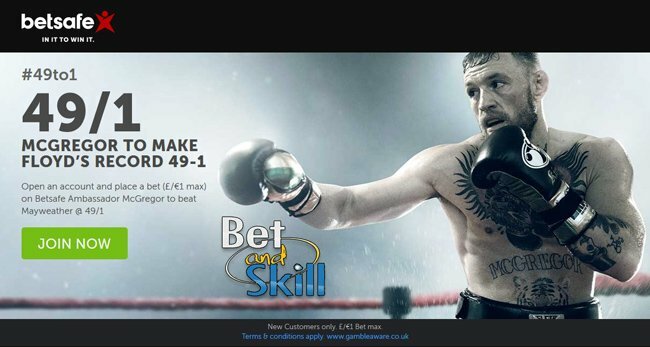 Conor McGregor 49/1 to beat Mayweather at Betsafe! Best price! Get 49/1 McGregor to beat Mayweather at Betsafe! Best price! Floyd Mayweather is sitting on an unbeaten 49-0 record but Betsafe is backing their man to stop Mayweather from reaching the 50-0 mileston with an industry leading off of 49/1, and with McGregor (called Mystic Mac) predicting he will knock the American out between rounds one to four, why not get behind the UFC superstar! Join Betsafe via our special links and claim 49/1 for McGregor to beat Mayweather! 4) Get your €/£49 net profit if McGregor wins the bout! By placing your bets, you will also get the chance to win the Notorious VIP Weekend package! This boosted odds offer is available to all new customers that register an account from 09.08.17 at 08:00 CEST. 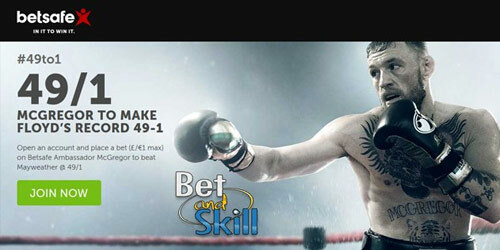 Maximum bet on the 49/1 (50.0) is £1/€1/$1/10 SEK/10 NOK. All Free Bets and Safe Bets will be voided. Customers depositing via Neteller or Skrill (Moneybookers) are not eligible. In case of dispute, Betsafe management’s decision is final. The offer is available only once per person, household address, email address, debit/credit card number, and IP address on criteria fulfilment. This offer is available for United Kingdom, Irish, Swedish and Norwegian residents only. This promotion runs between 09.08.17 to 15.08.17. A minimum bet of £/€1 on any Floyd Mayweather v Conor McGregor market is required. To be eligible to win the prize, customers must answer the question correctly. One pair of tickets for the McGregor v Mayweather fight will be available for this promotion in each of the following countries: United Kingdom, Ireland, Sweden and Norway. Winners will be randomly selected on 16.08.17 and will be contacted by 12.00 CEST that day. Reasonable efforts will be made to contact the prize winners via telephone and email. Those failing to respond to such notification within 24 hours will no longer be eligible for the prize and a new winner will be randomly selected. ✔ Flight to Las Vegas on Conor McGregor's private jet. By accepting the prize package, the winner will allow promotional material to be published on site, video, and any other media, including their name and image. All costs over and above the prize package are at the expense of the prize winner. Any incidentals must also be paid for. The ticket is non-exchangeable for cash or any other prize and non-transferable. Winners need to be eligible to travel to the United States and the UK between 25.08 and 27.08 and be above 21 years old at the time of the trip to be eligible to win a package. All travel visas and any other legal requirements in order to travel to the United States are the responsibility of prize winners. Ticket holders will need to present valid identification on entering the venue. Betsafe.com reserves the right to modify, alter, discontinue or terminate this promotion at any time and for any reason. "Conor McGregor 49/1 to beat Mayweather at Betsafe! Best price!"